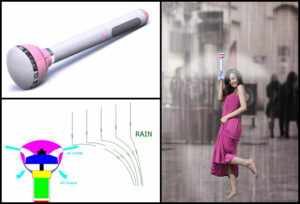 Share the post "Air Umbrella"
The original umbrella went from shading people from the sun and protecting from rain, to being a high tech gadget. The umbrella as we know it, with its whales and its canvas, will it soon be obsolete? This is, in any case, the Chinese inventors’ bet of the Air Umbrella. This umbrella has only a handle, which hides an air propulsion system that generates, as soon as it is activated, a sort of dome-shaped air shield capable of deflecting raindrops. 24 hours from the closing of their fundraising on the crowdfunding site kickstarter.com, they had already raised almost $ 100,000 which is 10 times the amount sought. The Air Umbrella consists of a cylindrical handle containing a lithium battery, with a switch at its lower end and a half-sphere at its upper end surmounting an engine through which air passes. In this half-sphere, a fan draws air to its base to drive it at high speed towards the periphery, creating a virtual protective dome above the wearer’s head. Prototypes developed to date have a range of 15 to 30 minutes depending on size. The wind would be powerful enough for two people to be protected from drops. It will obviously be possible to adjust the air power to extend the protection. If in theory the idea seems to work, one is entitled to question the effectiveness of this system in practice. In addition, by protecting you, the Air Umbrella could well water your neighbors even more on the sidewalks. 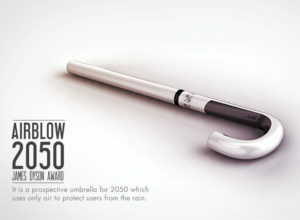 The design of the Air Umbrella is a little more different from the AirBlow 2050’s. 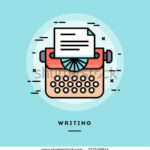 While the latter retains the rounded shape of the handle of an umbrella, the first has totally revised the appearance of the umbrella to make it more design and futuristic. The producers of the object, installed in China are making great efforts to improve the appearance, grip and battery life of the product. There is also the question of the ecological impact of such an invention: why use a lithium battery to protect itself from the rain, while a simple canvas can do just as much without energy expenditure? This is simply a big jump in the market of an umbrella. Its something very handy and what a fantastic technology. Forget your umbrellas turning upside down on a windy day. Though it seems a little weird to not have the rounded umbra or the covered area. This would be a fantastic idea.